As MacArthur Award–winning educator Lisa Delpit reminds us—and as all research shows—there is no achievement gap at birth. In her long-awaited second book, Delpit presents a striking picture of the elements of contemporary public education that conspire against the prospects for poor children of color, creating a persistent gap in achievement during the school years that has eluded several decades of reform. Delpit’s bestselling and paradigm-shifting first book, Other People’s Children, focused on cultural slippage in the classroom between white teachers and students of color. Now, in “Multiplication Is for White People”, Delpit reflects on two decades of reform efforts—including No Child Left Behind, standardized testing, the creation of alternative teacher certification paths, and the charter school movement—that have still left a generation of poor children of color feeling that higher educational achievement isn’t for them. In chapters covering primary, middle, and high school, as well as college, Delpit concludes that it’s not that difficult to explain the persistence of the achievement gap. 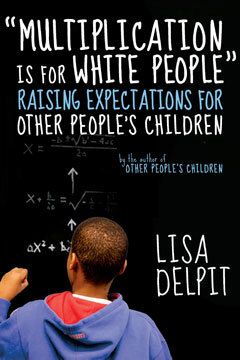 In her wonderful trademark style, punctuated with telling classroom anecdotes and informed by time spent at dozens of schools across the country, Delpit outlines an inspiring and uplifting blueprint for raising expectations for other people’s children, based on the simple premise that multiplication—and every aspect of advanced education—is for everyone.